Karen Phillips is one of Australia’s most sought after strategists in brand management, client communications and team improvement. She has worked some of the world's leading brands across a diverse range of industries and offers a rare knowledge and understanding of the multi-levels of communication, brand management, online maximisation and client connections. Specialising in training organisations how to effectively manage clients, build brand presence and cultivate staff momentum, Karen communicates with clients in an interactive and highly effective way to produce direct results. 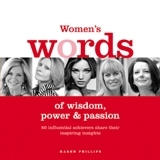 Karen has also created a national program to inspire and mentor women, with the launch of the Women's Words Project — which includes an online community for women www.womenswords.com, the launch of the highly acclaimed book, Women's Words Of Wisdom Power & Passion, and the Empowering Young Women Project.